I’ve already posted a recipe for Choco Nut Drops. But, I got a question on that post wondering if they could be made somehow without the peanut flour. I get substitution questions often, and while I always try to offer my best guess, I rarely actually try out what I suggest. And we all know cookies are my favorite thing. And, they were already grain-free and vegan. And chocolate. And peanut butter. Like you could stop me from trying out my suggestions. Jessica – this one’s for you. In a large bowl, beat the peanut butter and palm sugar until creamy. Add the flax egg and beat until well incorporated. Add the rest of the ingredients (except peanuts) and beat well. Knead a few times to form a dough. The dough will seem greasy. Don’t worry. The cookies don’t. Knead in the peanuts. Scoop spoonfuls and roll into rough balls. Flatten them with the palm of your hand onto parchment-lined baking sheets. I haven’t forgotten about that giveaway coming up later this week. I’ll give you a hint. It’s something you can reuse over and over again. And it’s something that kids love. Don’t forget to check back later this week! For more slightly indulgent recipes, check out Slightly Indulgent Tuesdays. 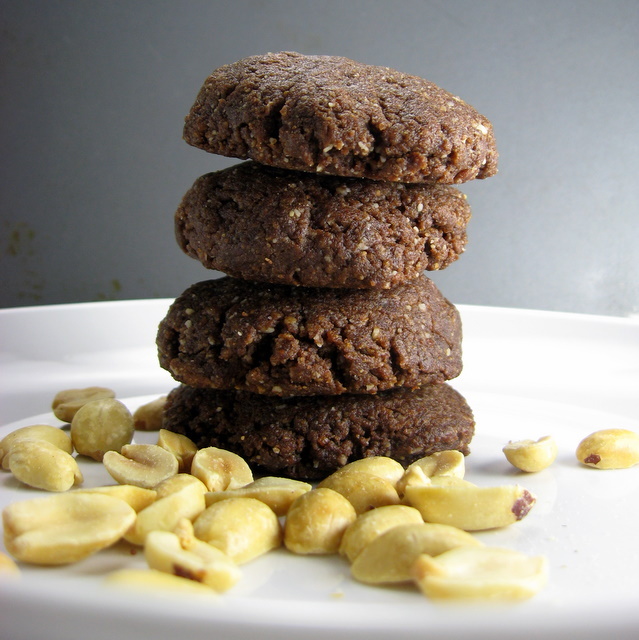 This entry was posted in chocolate, cookies, desserts, grain-free, nuts, peanut butter, vegan and tagged cookies, grain-free, recipes, vegan. Bookmark the permalink. Oh of course! Strictly to compare. You pretty much have to compare, right? Oh, and it might required a bit of almond milk if you use almond butter. Almond butter is much thicker than the natural peanut butter. Hm…maybe I need to make a version with almond butter. Looks Good! Thanks! Visit me at http://raisingdieter.blogspot.com/ for recipes! ohhh these are soo delish!!! I am making them right now and eating the dough right out of the bowl! I can’t wait to give these to my kids in the morning! Do you think I could use agave nectar instead of sugar? You could probably use agave nectar, though, again, you might need to tweak the almond and coconut flour proportions. It’s a pretty forgiving recipe, though. So, tweak away.